Super Hero Boy: Ecofriendly creative fun! Though Elmer's glue was a huge part of my life growing up from art projects to just playing around but up till now I've always just associated Elmer's with that classic white glue and the ever popular glue sticks which I still swear by for art projects. Though not necessarily related craft kits were one of my favorite gifts growing up. We were on the road a lot and I always needed something to keep me busy. Video game systems were not quite as portable back then and the game boy was not nearly what it is now so I went through kits of all kinds, looms, color by numbers, painting, jewelry, though my favorites were always the ones that actually required me to do much of the work myself. Well Elmer's has so much more to offer than just glue. They offer everything from art supplies to really cool science kits these days and I spotted one that I would have loved as a kid. The Bill Nye Paper Recycling Factory is not just fun but its a great place to start when it comes to teaching your kids about recycling. The kit includes a mixer that you load little bits of shredded paper into with some water and make the pulp that will eventually become your paper. Though the mixer is a bit tricky to master at first with a little practice you can get it going. Depending on what sort of paper you use makes a huge difference on what sort of paper you will make. Any dyes or colors in the paper will come back through in the finished product as well. It's actually sort of fun to try to guess how your paper will turn out as its always a bit of a surprise as just because your shredded paper looks a little pink you might be surprised to find out that your end product is more purple or grey becomes black. After awhile you will get pretty good at predicting but at first it seems more like a magic trick. Once you get brave you can start working on something a little more creative like making two toned papers or designs. Really you can make anything you can think up and some creative use of cookie cutters will give you some new creation ideas. Really the only limitation to the set is the fact that you can only make one piece of paper at a time which adults might find a bit boring but seeing as the attention span of most kids is fairly short it actually gives the kit a bit more life as if they really want to make something cool they will have to use it more than just once! 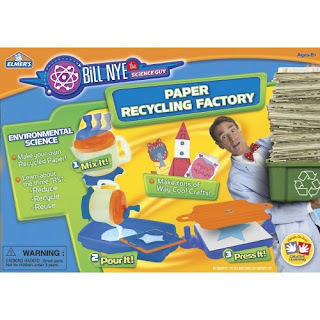 You can see the entire line of Elmer's Science Kits over on their website and the Bill Nye Paper Recycling Factory is available for sale directly from Elmer's or you can even pick one up on Amazon!! sounds like a fun kit! Bill Nye is very informative too. It's nice they put in the educational aspect.